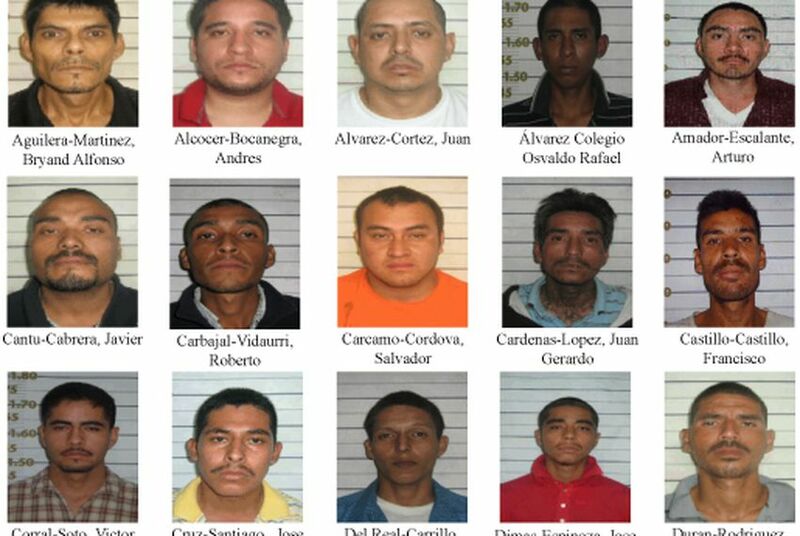 The Webb County Sheriff's Department has released the names and photographs of 151 inmates who escaped from a Mexican state prison on the border this month. So far, he says, there is no evidence the convicts have fled to Texas. The Webb County Sheriff’s Department has released the photographs of the inmates who escaped from the state prison in Nuevo Laredo, Tamaulipas, on Dec. 16. Nuevo Laredo is just across the Rio Grande from Laredo. Sheriff Martin Cuellar said his office is in the process of gathering more information on the inmates, including their dates of birth and whether any are U.S. citizens. The escapees are believed to be members of the Los Zetas drug cartel and were released during a plan orchestrated by inmate Orlando Monsisvais Treviño, 28. Cuellar said Monsisvais Treviño is the nephew of Miguel Treviño Morales, a.k.a. “El 40” or “Zeta-40,” believed to be the second in command behind Zeta leader Heriberto Lazcano Lazcano. Cuellar told the Tribune the escape was an attempt to swell the ranks of the criminal organization, which has been entrenched in a battle with its former allies, the Gulf Cartel, for control of the plazas that extend from Mexico to Texas and beyond. More than three-dozen prison guards have been arrested for assisting the prisoners in their escape, according to local media reports. Cuellar said there is no evidence any of the escaped inmates are in Texas right now but nonetheless urged anyone with information on any of the alleged cartel members to call the department at 956-523-4500 or Crime Stoppers at 956-727-8477. Laredo is familiar territory to the Zetas and Treviño, who in 2005 and 2006 ordered the murders of several rivals from the Sinaloa cartel as the two battled for control of the smuggling routes. He supplied the equipment, payment and safe houses for his hit men, including Rosalio “Bart” Reta, who was a teenager when he was convicted of murder for killing at the behest of the cartel boss. The U.S. Department of State is offering up to $5 million for information that leads to the arrest of the reputed gang leader, according to the Drug Enforcement Administration’s Houston office.